Tools:Sponge Dauber; 3-D Dots: Foam Squares; WRMK: Corner Chomper; Spellbinders: Fancy Tags Two. 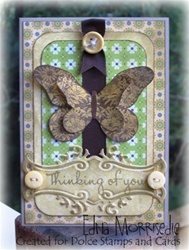 Inspiration for this card started with the need for a green birthday card, so once I had settled on these papers, I opted to get all inky with the edges to bring the quite modern papers in line with the etched style of the butterfly image. I wanted to pop up the wings of the butterfly with a double impression, but instead of extending the wings on the already large image, I cut down the second pressing and made a smaller version of the butterfly and gave it centre placement.